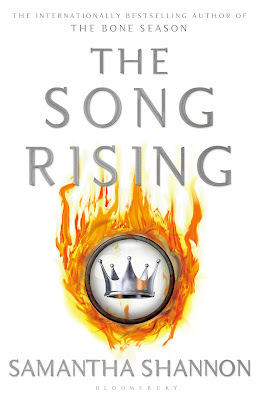 It begun as a revolution on the streets of Ireland now Paige Mahoney is determined to conquer Scion London. Recovering from her injuries sustained in the endeavor to become Underqueen, martial law has now been imposed while authorities begin the search for the former Seven Seal. Scion military technology Senshield is threatening the existing of The Mime Order, separated into factions after The Pale Dreamer challenged her Mime Lord Jaxon as Mollisher for the prestigious title. The clairvoyant community is hostile and to achieve accord, Paige will need to prove worthy of the Underqueen reign, destroying Senshield and ensuring the freedom for her Mime Order. The Song Rising begins shortly after the Rose Ring completion, Paige the Mollisher who challenged her Mime Lord Jaxon after learning of his involvement within Scion London. Paige may be victorious but cannot command her Mime Order, lacking the respect and confidence of the Clairvoyant community. Paige is a determined young woman who continues her plight to expose the cruelty of Scion, selling Clairvoyants into slavery under the reign of the Rephaim. With her newly appointed Mollishers Nick and Eliza, Paige will secure freedom for the Mime Order by destroying Senshield, Scion technology that is being used in domestic warfare against those deemed Unnatural and Paige understands the tragedy of warfare. Although Paige is Underqueen, she cannot independently rule without the assistance of Terebell, Rephaite sovereign elect of the Ranthen, leader of the covert revolutionaries and Warden, her loyal mercenary. The attraction between Paige and Warden had begun as Paige was held captive in Sheol, their friendship and tentative relationship is quiet and does not overwhelm the narration. Paige continues to place the importance on her community rather than her own personal journey. Warden is frustrating and although he is gentle with Paige and often seeks consent before the softest of touches, he continues to serve Terebell and places his loyalty with the Rephaim leader. Considering he also served as a leader during the Bone Season at Sheol where Paige and her Clairvoyant peers were imprisoned and trained as fighters against their will. When it comes to Terebell's leadership, his backbone seems to have deserted him. I'm assuming Warden may be detrimental to the narration in the remaining series installments but the formality and lack of emotion are beginning to aggravate me. The atmospheric world of Scion London is so incredibly vivid and The Song Rising also explores a derelict Ireland still grasping onto independence. Although Paige has spent the past thirteen years in London, she maintained her Irish heritage and is often referred to as Brogue. Irish characters typically only exist in young adult novels as being a mythical stereotype. Samantha Shannon is extraordinary and The Bone Season series is a phenomenal fusion of fantasy, and science fiction occupying a dystopian United Kingdom. Atmospheric, breathtaking and exceptional. I agree that Warden is starting to be a bit more aggravating. His character needs to come out of his shell a bit more or else I'm going to start losing interest in him. I am already losing interest in the two of them with this addition to the series, which isn't a good thing! I enjoyed this one, but my favorite is still The Mime Order! I completely agree Ali. Their relationships feels as though it's regressing now and while it's understandable given the circumstances, it's irritating. Warden's character hasn't matured in the same vain that Paige has. I'm still absolutely enamored by the series and really loved Paige's role in The Song Rising. Sounds really interesting, maybe the characters need some more action? It's a brilliant series but I just need more from Warden's character. It can feel as though he's working against Paige at times when they're both fighting for the same cause. Is this the end? I haven't read The Mime Order so I haven't picked up a copy of The Song Rising. Warden was alread a very reserved character in The Bone Season so I see not much has change. It isn't actually, there's another four books to go thank goodness. I absolutely love the series. He seems to casually be absent whenever Paige is faced with a new adversity. I'm hoping he can find his spine before the fourth installment. A dystopian UK? I am intrigued! I have indeed seen this around, but never got into it (sadly) Great review! The world building is incredible Verushka, so vivid and atmospheric. It's one of my favourite elements of the series. I had the first book but didn't end up reading it. I don't really think it's for me but I passed it on to my MIL and she loves it. Isn't there supposed to be a movie too? I'm not entirely sure Karen. It's marked as being in development but there doesn't seem to be any news of late. I think the rights may be been optioned. Oh no, it's well worth the read and the series grows with each installment. You might need to steal it back. "...The Bone Season series is a phenomenal fusion of fantasy, and science fiction occupying a dystopian United Kingdom. Atmospheric, breathtaking and exceptional." AHHHHHHHHHHH I'm hanging out to start this series!!! Damn you make it sound so good. I wonder how many books there will be all up? I'm hoping to read the first book this year - It's sitting on my shelf waiting for me. I believe there will be seven, not including any novellas. It'll be a long series but worth the investment Sarah, it's phenomenal. I really need to start this series - it sounds so good! It's absolutely wonderful Megan and set in a dystopian UK as well. I would love to see what you think of it.